The Clark School has identified eight strategic research themes as part of our 2020 Strategic Plan where our faculty, researchers, and students are poised to make an impact. 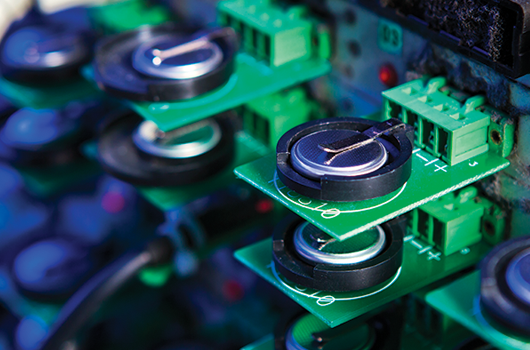 Battery cells being developed with salt water electrolytes at the Clark School could offer safer, more powerful alternatives to lithium-ion batteries. By providing a creative and innovative environment, the Clark School fosters fearless ideas and enables students, staff, and faculty to work on society’s most challenging problems in energy, healthcare, and security in a manner that enhances local, state, and national economic development. Assistant Professor Ryan Sochol and undergraduate researcher Aaman Mengis use nano 3D printing technology to study the migration behavior and mechanical forces of living cells in the Department of Mechanical Engineering's Bioinspired Advanced Manufacuting (BAM) Lab. Researchers in the Maryland Robotics Center and Department of Mechanical Engineering have created bio-inspired robots the size of an insect with magnetically actuated legs capable of variable gaits. Professor John Fisher and graduate student Che-Ying Kuo from the Fischell Department of Bioengineering helped create the first ever 3D bioprinted placenta models to help study preclampsia, a life-threatening pregnancy complication. Faculty, researchers, and students in the Clark School are part of the Maryland Cybersecurity Center, which was created to facilitate a comprehensive, interdisciplinary approach to cybersecurity with particular strengths in the areas of cryptography, programming-language and software security, behavioral aspects of security, empirical security, and cybersecurity economics. Research in the Department of Civil and Environmental Engineering's National Transportation Center explores all facets of transportation infrustrutcture, technology, and policy to improve national transportation systems. A new ambient temperature diagnostic imaging technique developed by Assistant Professor Marina Leite and her team in the Department of Materials Science and Engineering helps make it possible to find and correct inefficiencies in solar cells. Research like that of Assistant Professor Mohammad Hafezi in the Department of Electrical and Computer Engineering is exploring the unique behavior of quantum systems to develop new data processing advances and create new exotic states of light. The virtual reality scenarios carried out in the Hybrid-System Integration and Simulation Lab are used to evaluate and improve patient monitoring systems in hospitals.